Servomotors have three wires. The black wire is connected to the ground (Vss) of your BS2, the red wire to the positive voltage (Vdd), and the white wire to the signal source (P12). 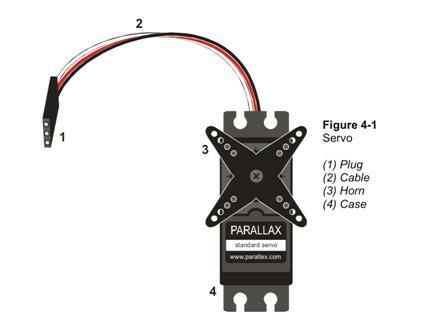 Servo motor using 3 pin connector into BS2 breadboad. In this lesson, you will learn to use the Pbasic code word PULSOUT and you will use FOR…NEXT LOOPS in order to control the servomotor speed, direction, and position. PULSOUT is code that creates PWM at a certain frequency. A servomotor is rotated by using the micro controller to send very brief high and low signals over and over again every 20 ms. The high signal’s duration is between 1 and 2 ms.
Pin is the specified output pin you want the pulse to come from. Duration creates a high signal in two –millionths-of-a-second (ms) time intervals. A microsecond (ms) is one millionth of a second. 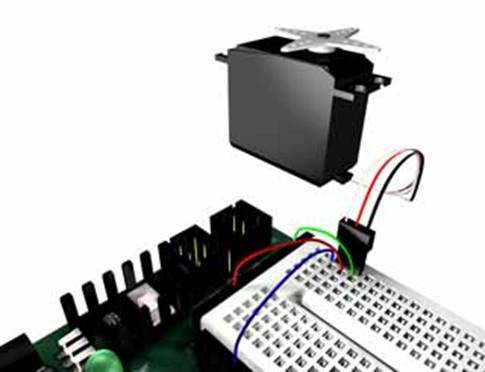 The first program we will explore is one called Simple Servo, and it allows you to control the movement of a servomotor through a full swing of the servo. Notice that it moves fast and that if you hold the horn a bit, it will fight you to get to the place the feedback unit is instructing it to travel to. This next program has two separate parts, the servo will step through a number of small rotations and then move backwards rapidly to its original position and start the cycle again. In the first program, the position of the servo was provided in the code by the numbers 500 and 1000. In this program the servo positions will also be numbers, but given representationally in the variable named ‘forward’. The first movements are accomplished with a clever application of the FOR…NEXT command, which starts with 500 and counts to 1000 by hundreds each time it cycles. 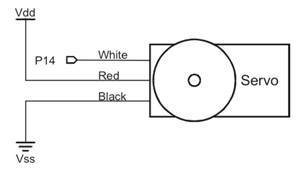 Large numbers need to be used in this loop because servos only accept numbers between 500 and 1000. Whenever the program sees the variable ‘forward’, it will use whatever number the FOR…NEXT loop is currently providing as the position information for the PULSOUT command. Here, the FOR…NEXT loop acts both as a programming loop and as a numerical generator for the servo’s position information. In the last part of the program, the command PULSOUT 12, 500 is used to return the servo to its starting position. The next program is designed to move the motor very slowly. This is controlled by creating a new variable called ‘time’, which is counted step-by-step, as the FOR…NEXT loop advances. PULSOUT 12,time 'send a pulse that varies from 2 ms to 1000 ms.
Now try changing the pause lengths and see what happens. Remember, a pause below ten will not give the servo enough time to respond, but go ahead try it out to see what happens.